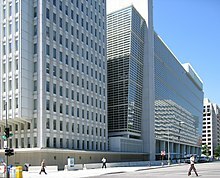 The World Bank is an international bank that lends money and other help  to developing nations for infrastructure. The World Bank has the goal of reducing poverty. 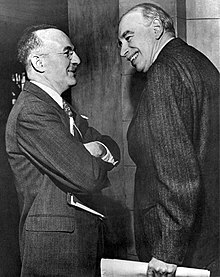 The World Bank and the International Monetary Fund are both based in Washington DC, but the World Bank is headed by an American, while the IMF is led by a European. People also say that the World Bank pushes U.S. or Western interests in certain parts of the world. Even South American nations have established the Bank of the South in order to cut down on US influence there. The fact that the President is always a citizen of the United States, nominated by the President of the United States makes some people unhappy. The US has just over 16% of the shares in the bank; some people say this makes the voting unfair because they have too much power, as decisions only happen if the countries that support it have 85% of the bank's shares. The World Bank also does not need to explain what it does to anyone. A lot of the criticism has led to protesting. The World Bank Oslo 2002 Protests, the October Rebellion, and the Battle of Seattle are among the protests that have happened. Such demonstrations are held all over the world, even amongst the Brazilian Kayapo people. ↑ "Boards of Directors". World Bank. ↑ Landler, Mark (December 15, 2007). "Britain Overtakes U.S. as Top World Bank Donor". The New York Times. The New York Times Company. Retrieved 2007-12-15. ↑ "Organization". The World Bank Group. Retrieved 2009-03-25. ↑ MacClancy, Jeremy (2002). Exotic No More: Anthropology on the Front Lines. University Of Chicago Press. ISBN 0226500136. ↑ Hertz, N. (2004). I.O.U. : The Debt Threat and Why We Must Defuse It. London: Harper Perennial. ↑ "New South American bank planned". 9 October 2007 – via news.bbc.co.uk. ↑ Wade, Robert (2002). "U.S. hegemony and the World Bank: the fight over people and ideas". Review of International Political Economy 9 (2): 215–243. doi:10.1080/09692290110126092. ↑ Monbiot, G. (2004). The Age of Consent. London: Harper Perennial. ↑ Stone, Diane and Wright, Christopher eds. (2006). The World Bank and Governance: A Decade of Reform and Reaction. Routledge. ↑ Gibbs, Walter (2002-06-25). "World Briefing - Europe: Norway: Protests as World Bank Meets". New York Times. Retrieved 2019-03-11. ↑ Clarence Williams and Michael E. Ruane (Oct 20, 2007). "Violence Erupts at Protest in Georgetown". The Washington Post. p. B01. Retrieved 30 May 2008. ↑ Aditya Chakrabortty. (2008). Secret report: biofuel caused food crisis. The Guardian. ↑ de Vries, Barend A. “The World Bank’s Focus on Poverty.” The World Bank: Lending on a Global Scale Eds. Jo Marie Griesgraber and Bernhard G. Gunter. London and Chicago: Pluto Press, 1996, pp.68. ↑ 38.0 38.1 38.2 38.3 de Vries, Barend A. “The World Bank’s Focus on Poverty.” The World Bank: Lending on a Global Scale Eds. Jo Marie Griesgraber and Bernhard G. Gunter. London and Chicago: Pluto Press, 1996, pp.69. ↑ de Vries, Barend A. “The World Bank’s Focus on Poverty.” The World Bank: Lending on a Global Scale Eds. Jo Marie Griesgraber and Bernhard G. Gunter. London and Chicago: Pluto Press, 1996, pp.70. ↑ Tan, Celine. “The poverty of amnesia: PRSPs in the legacy of structural adjustment.” The World Bank and Governance: A Decade of Reform and Reaction. Eds. Diane Stone and Christopher Wright London and New York: Routledge, 2007, pp. 147. ↑ Tan, Celine. “The poverty of amnesia: PRSPs in the legacy of structural adjustment.” The World Bank and Governance: A Decade of Reform and Reaction. Eds. Diane Stone and Christopher Wright London and New York: Routledge, 2007, pp. 152. ↑ Tan, Celine. “The poverty of amnesia: PRSPs in the legacy of structural adjustment.” The World Bank and Governance: A Decade of Reform and Reaction Eds. Diane Stone and Christopher Wright London and New York: Routledge, 2007, pp. 152. ↑ Chossudovsky M. The Globalization of Poverty: Impacts of IMF and World Bank Reforms. Penang: Third World Network, 1997 in Tan, p. 152. ↑ "Fraud and Corruption". World Bank. 2009-10-24. (page: link). ↑ 45.0 45.1 45.2 "The World Bank and the Question of Immunity" (PDF). IFI Watch Bangladesh. September 4, 2004. ↑ "Soverign Immunity" (PDF). World Bank. Retrieved 2009-10-24. ↑ Adam Isaac Hasson. "EXTRATERRITORIAL JURISDICTION AND SOVEREIGN IMMUNITY ON TRIAL:NORIEGA, PINOCHET, AND MILOSEVIC—TRENDS IN POLITICAL ACCOUNTABILITY AND TRANSNATIONAL CRIMINAL LAW". Retrieved 2009-10-23. ↑ "Crime and Reward: Immunity To The World Bank". 6 November 2004. ↑ "Water Policies and the International Financial Institutions". Public Citizen. ↑ "World Bank Approves Multi-Billion-Dollar Loan for Coal-Fired Power Plant in South Africa". Democracy Now!. This page was last changed on 13 March 2019, at 08:41.